For the price, these headphones are AMAZING. The bass is enhanced to a point that any song that has a lot of bass will sound how it should, but not so much that that the Bass is overpowering. The treble is proportionate to the base, so the headphones provide a balanced listening experience that few headphones in this price range can match. During a comparison, i found the bass on the Hd 428s to be comparable to that of the Monster Beats Studio Headphones. 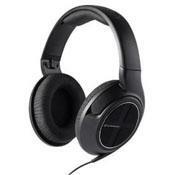 They are wonderfully comfortable with earpads that create a decent acoustic seal against the head. Unfortunately, the sound quality does diminsih slightly when there is any significant amount of outside noise. But in silence or near silence, these headphones are,as i said before, AMAZING.